- each starts with some manifestation of: "To begin with, they never got along." - start with some manifestation of: "To begin with, they never got along." - last exactly 2:30 min. 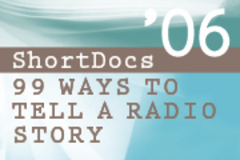 In the end, 101 stories from around the world were submitted to 99 Ways To Tell a Radio Story. Four were chosen as the 2006 ShortDocs, and were presented, with producers on-hand, at the opening session of the 2006 Third Coast Conference. Producer Sasha Aslanian's divorced parents listen to audio of their 1963 wedding vows, remember what went wrong, but still can't get over each other. A crush on a telemarketer results in betrayal. Translation -- Sylvain, Bruno, Zoe, and Youssef at the PRIM Centre in Montreal, summer 2006. With Grandma, things start bad and get worse. The answering machine traps a surprising revelation from an "old friend."